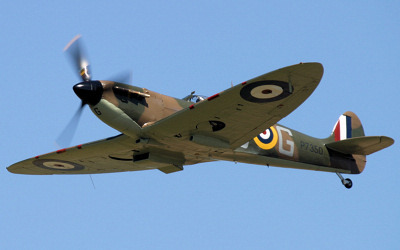 Battle of Britain Memorial Flight, BBMF Aircraft - Display Teams - Military Airshows in the UK. Display Schedule. The Battle of Britain Memorial Flight or BBMF presently consist of twelve aircraft:- 6 Spitfires, 2 Hurricanes, Lancaster, Dakota, and 2 Chipmunks. They are operated by the Royal Air Force and have been based at RAF Coningsby in Lincolnshire since 1976. 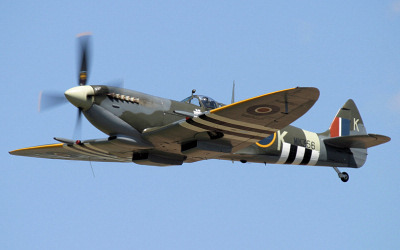 The BBMF participate in scores of Air Displays and events every year. The display crew and groundcrew are all volunteers drawn from the Royal Air Force. The Flight routinely makes over 700 individual aircraft appearances during a year, ranging from major air shows to village fetes. 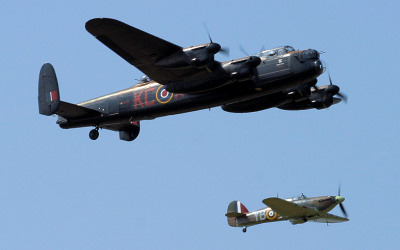 The BBMF are usually represented at air shows with the Lancaster flanked by a Spitfire and Hurricane. P7350 was built at Castle Bromwich and entering service in 1940 when she took part in the Battle of Britain. From April 2019, P7350 represents 54 Sqn's Spitfire Mk 1 R6981, 'KL-B', "KIWI III", the personal aircraft of the then Flt Lt Al Deere DFC from 10 Jul 1940 (the official start of the Battle of Britain) until 15 August (when it was lost after Deere baled out of it due to damage incurred in a combat with ME Bf109s). AB910 was built at Castle Bromwich and came off the production line in August 1941. A WAAF Groundcrew who had tailridden this aircraft, which was standard practice while taxi-ing to the end of the runway, was about to dismount when the pilot took off. The pilot did a circuit and then landed because of handling difficulties only to find the WAAF still clinging to the tail of the aircraft. 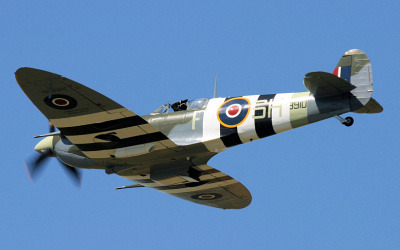 It is now painted in the colour scheme of a 64 Squadron Spitfire at the time of 'D-Day,' with full invasion stripes. MK356 was built at Castle Bromwich in 1944. This Spifire has claimed a 1/2 kill against an Me-109. 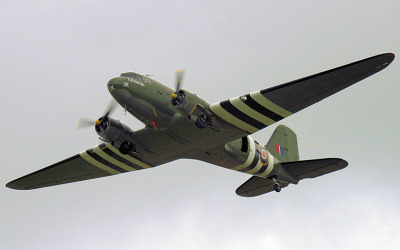 She was aquired by the BBMF in November 1997 and this was the first time she had flown since 1944. Spitfire MK356 is now painted to represent Spitfire Mk IXc ML214, coded '5J-K', the personal aircraft of Squadron Leader 'Johnny' Plagis, the Commanding Officer of No 126 Squadron from July 1944. Built in November 1945 as a high altitude photo reconnaissance aircraft with a Griffon 66 engine and pressurised cockpit, PM631 was delivered to the RAF in 1946 so she was to late to see any operational service. 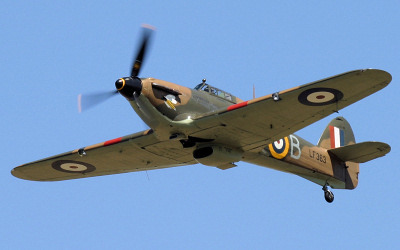 This is the BBMF's longest serving aircraft. PM631 is presented as a PR XIX of No 541 Squadron which performed photographic reconnaissance missions over the Europe from early 1944 to the end of the war. PS915 was just too late for the war, joining 541 Squadron at Benson in June 1945 before moving to the PR Development Unit to take part in tests of new cameras. 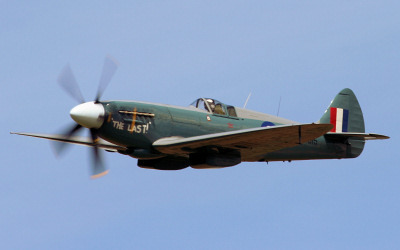 In 1957, PS915 became a founder member of the Historic Aircraft Flight, the forerunner of the BBMF, but was quickly retired to gate-guardian duties. She re-joined the BBMF in 1987 after being modified to take an ex-Shackleton Griffon 58 engine and refurbished to flying condition by British Aerospace (Warton Division). 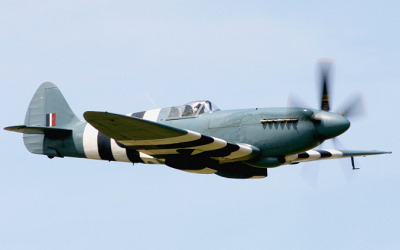 Spitfire PS915 wears the colours of one of Ted Powles Mk.XIX Spitfires. 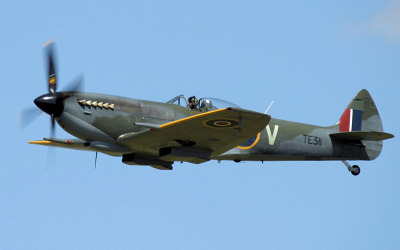 Spitfire TE311 is a low-back/bubble-canopy Mk XVI with 'clipped' wingtips. Some 58 years after it last flew, TE311 was put back in the air in 2012, having undergone a painstaking re-build to flying condition by BBMF technicians, which was started in October 2001. TE311 is currently painted as Spitfire XVI TB675 '4D-V', the aircraft of Squadron Leader Tony Reeves DFC, who was the Commanding Officer of No 74 Squadron from the end of December 1944. PZ865 was the last of 14,533 Hurricanes to be built at Langley in 1944. She was used by Hawkers for a communication and test aircraft. 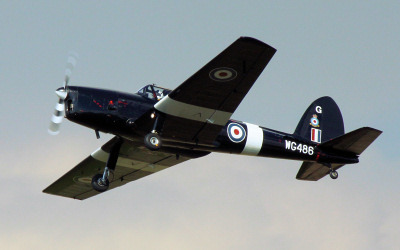 PZ865 was entered in the Kings Cup Air Race by HRH Princess Margaret. Flown by Group Captain Peter Townsend it achieved second place. After a complete overhaul, PZ865 was flown to Coltishall in March 1972 and given to the Memorial Flight by Hawker Siddeley. In November 2010, PZ865 was sent to Duxford for major maintenance and refurbishment. Since 2012 this famous Hurricane has worn a new colour scheme, faithfully replicating Hurricane Mk IIC HW840, coded 'EG-S', of 34 Squadron, South East Asia Command during 1944, the personal aircraft of Canadian pilot, Flight Lieutenant Jimmy Whalen DFC. 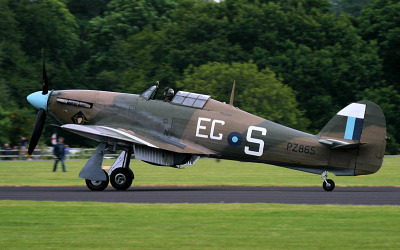 LF363 first flew in June of 1944 and is believed to be the last Hurricane to enter service. On September 11th 1991, during a flight from RAF Coningsby to Jersey, she suffered engine trouble and made a crash landing at RAF Wittering. The aircraft was seriously damaged by the crash and the ensuing fierce fire, fortunately the pilot escaped with a broken ankle and minor burns. Since then she has had a complete rebuild and flew again in the autumn of 1998. Since June 2017, LF363's port side is marked up as GN-F, representing Tom Neil and his 249 squadron Hurricane and the starboard side is marked up with SD-A, representing one of the 501 squadron Hurricanes flown by Paul Farnes. PA474 is one of only 2 airworthy Lancasters in the world, the other Lancaster being in Canada. She was built in Chester in 1945 and is one of 7377 that were built. She was originally earmarked for the 'Tiger Force' in the Far East but due to the end of the war was assigned to Photo-Recon duties with 82 Sqn in East and South Africa where she had her turrets removed and carried the identification letter 'M'. The Lancaster was returned to the UK and intended to be used as a pilotless drone but transferred to the Royal College of Aeronautics where she was used for trials on the Handley Page Laminar Flow wing instead. In 1964 was being prepared for future display at RAF Hendon. However she was restored at Waddington and had her turrets replaced and eventually joined the Battle of Britain Flight in November 1973. PA474 went in for major servicing at Duxford in 2016/17 and will be painted in a new livery. The port side will represent Lancaster BIII W5005 'AR-L' "Leader" of 460 (Royal Australian Air Force) Squadron, with its nose art of a kangaroo in wellington boots playing bagpipes reflecting the mixed nationalities of the crew. The starboard side of PA474 will wear the 50 Squadron code letters 'VN-T' representing Lancaster LL922 in which Flying Officer 'Dougy' Millikin (grandfather of the current OC BBMF, Andy 'Milli' Millikin) and his wireless operator John Tait flew 33 operations together. 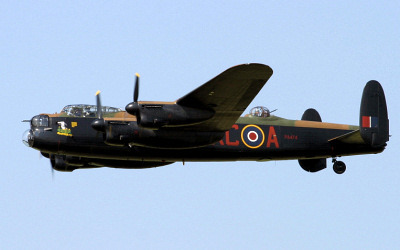 The starboard side of the Lancaster's nose will retain the coat of arms and name of The City of Lincoln. ZA947 was adopted by Strike Command and issued to the BBMF in March 1993. In 2004, an original and authentic floor and interior was re-fitted to the Dakota, returning the cabin to the original, wartime specification. As there are now no other multi-engine tail wheel aircraft in RAF service outside the BBMF, the Dakota is an important training asset used for initial training of aircrew for the BBMF multi-engine aircraft and for renewing the currency of the Flight's Lancaster pilots each year. In addition to this role though, the Dakota is a sought-after display aircraft in her own right and, as such, she appears regularly on the air show circuit either on her own or as part of a BBMF formation. She continues to be capable of para-dropping and is used in that role for special commemorative events. ZA947 is now painted to represent Dakota FZ692 of No 233 Squadron, around the D-Day period in 1944. This aircraft, which was named 'Kwicherbichen' by her crews, was involved in Para-dropping operations on the eve of D-Day and subsequently in re-supply and casualty evacuation missions into and out of forward airfields in the combat areas. The two De Havilland Chipmunks held on charge by the BBMF are the last in RAF service and are probably the least-seen aircraft of the BBMF's fleet. The 2 DHC-1 Chipmunks are used for training pilots on tail-wheel aircraft, pilot delivery to pick up fighters that have been serviced, delivery of small spare parts, and reconnaissance of new fly-past venues. WK518 has been with the BBMF since April 1983 and WG486 has been with the BBMF since 1995.